On Feb. 7, the XXII Olympic Winter Games will open in Sochi on Russia’s Black Sea coast. Nearly six-in-ten Americans (58%) say they’re looking forward to the Winter Olympics, making it among the most anticipated 2014 events we asked about. And while intentions may not always line up with actions, the Olympics finding is in line with the share of Americans who’ve said they’ve closely followed previous Games. The two exceptions were the 1996 (Atlanta) and 2004 (Athens) Summer Olympics. 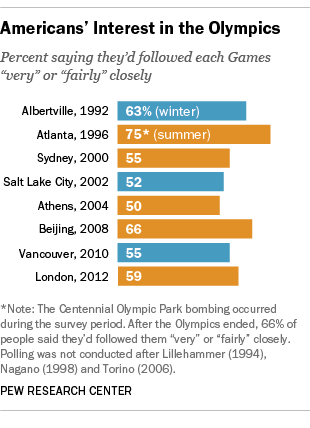 In 1996, the bombing at Atlanta’s Centennial Olympic Park occurred during our initial survey period; perhaps not surprisingly, 75% of people said they were following the Games closely — including 45% who said they were following them “very” closely, the highest interest level for any Olympics. In a follow-up survey in early September, a month after the Games concluded, interest had fallen back to 66%. During the Athens Games, the public was evenly split between those who said they were following the Olympics very or fairly closely (50%) and those who said they were following them not too or not at all closely (50%).